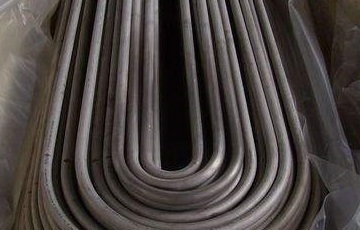 Monel 400 (UNS N04400) seamless tubes manufactured to ASTM B163 are mainly used for condenser or heat-exchanger service. These tubes are generally furnished in small size with light wall: from 3″ (76.2 mm) and under in outside diameter with minimum wall thickness of 0.148″ (3.76 mm) and under, and with an average wall thickness of 0.165″(4.19 mm) and under. ASTM B163 Monel 400 tubes 1″x0.065″x12ft. The Monel 400 tubes of ASTM B163 can be manufactured by either hot-rolling or cold-rolling process. It shall be furnished in either annealed or stress-relieved condition with relative surface finishes. 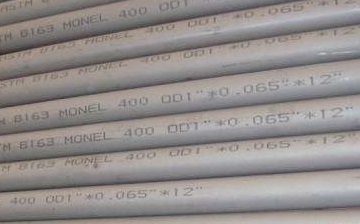 The hydrostatic test pressure for Monel 400 tubes shall be 17.5 ksi [120.6 MPa]. *The mechanical properties of ASTM B163 UNS N04400. The tubes are usually bent to suit for condenser or heat-exchanger service. The minimum bending radius shall be determined by tube O.D, average tube wall, and condition of the tube. U-Bent tubes of ASTM B163 UNS N04400. 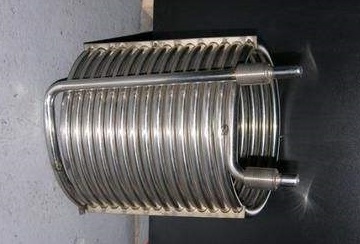 Helical bent-coils made of ASTM B163 seamless tubes.